The timeline that former FBI Director James Comey provided to lawmakers regarding who funded the anti-Trump dossier conflicts with court filings and congressional testimony. In House testimony for which a transcript was released Tuesday, former FBI Director James Comey maintained that Republicans first financed the dossier, then the Democrats. Testimony by ex-spy Christopher Steele – the dossier writer – and others shows the dossier did not exist until Fusion GPS engaged Mr. Steele in May-June 2016. By that time, a Republican funding opposition research with Fusion had bowed out two months prior. Fusion went to the Hillary Clinton campaign and Democratic National Committee to win funding to hire Christopher Steele, who in June wrote dossier memos accusing president Trump of colluding with Russia. The dossier a massive black eye for the FBI because it embraced the other party’s opposition research to obtain wiretaps on at least one Trump volunteer as well as to target others. This all happened under FBI Director James Comey’s watch. He signed the first surveillance warrant that attested to the Steele dossier’s accuracy. 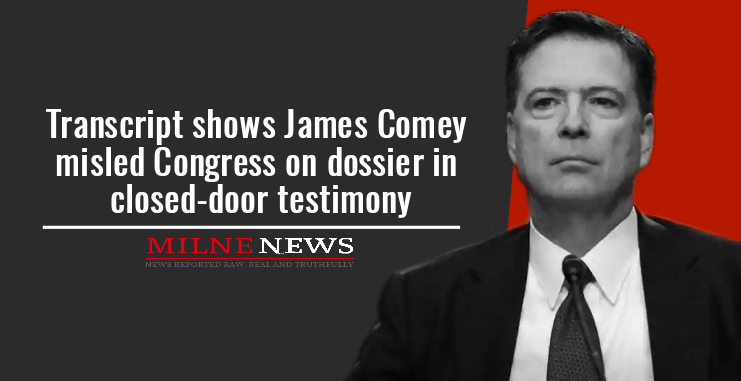 Comey during testimony before a House Judiciary-Oversight task force on Monday in closed session stated that a Republican funded the dossier first. “It was Republicans opposed to Trump, and then it was Democrats opposed to Trump,” Mr. Comey testified. Meanwhile, to this day none of Christopher Steele’s series of felony charges against President Trump and his associates has been proven publicly. a lot of it has been shown to be very far-fetched. According to Fusion co-founder Glenn Simpson, Republican Paul Singer and his Washington Free Beacon hired Fusion for general opposition research back in 2015 into Donald Trump that didn’t rely on Steele or focus on Russia. That relationship ended in April of 2016 when it appeared Trump would win the Republican nomination. Months later, Christopher Steele entered the scene and the now debunked dossier was born. Simpson told Congress he engaged Mr. Steele in May or June 2016.